Mango selection tips: If the mango feels a little bit soft to the touch, it's just right! 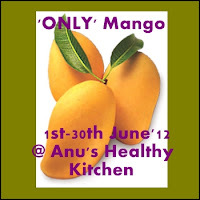 If it the mango feels firm, then you will have to wait a few days for it to ripen. here is the recipe of mango cupcake,yes its really awesome ,the cardamom give a great taste ,i love it!! Or simply eat as it is right from the oven with tea. Sift together the flours, milk powder, baking powder, and baking soda and sugar. Add crushed Pista or cashewnuts(optional). Blend together mango pulp, yogurt/sour cream, and canola oil. Pour this into flour mixture and fold slowly to get a uniform mixture. Add hot water as needed to make the batter smooth and easy to pour consistancy. (About 1/4 cup or less water is needed. Grease the baking pan with cooking spray or ghee or butter. Pour the above mixture into this greased pan.Bake at 350 degrees Fahrenheit for about 25-30 mins. Poke a knife into the cake and pull it out. If the cake is done, the knife will come out clean. Hi Sha jabi, eggless mango cake looks so very cute and delicious. 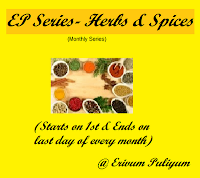 Thanks for linking it to EP Series. Following you, Best Wishes and Happpy Blogging!!!! They look pretty moist.. .good job! !